Angela Merici, foundress of the Ursuline Sisters, was born in the small Italian town of Desenzano on the shore of Lake Garda in 1474. As a young girl, Angela lost in succession her sister and both of her parents. She went to live with a wealthy uncle in the town of Salo where, without benefit of formal schooling, Angela grew in poise, wisdom, and grace. The age in which Angela lived and worked (the 16th Century), was a time which saw great suffering on the part of the poor in society. Injustices were carried on in the name of the government and the Church, which left many people both spiritually and materially powerless and hungry. The corruption of moral values left families split and hurting. Wars among nations and the Italian city-states left towns in ruins. In 1516, Angela came to live in the town of Brescia, Italy. Here she became a friend of the wealthy nobles of the day and a servant of the poor and suffering. Angela spent her days in prayer and fasting and service. Her reputation spread and her advice was sought by both young and old, rich and poor, religious and secular, male and female. But still, Angela had not yet brought her vision to fruition. After visiting the Holy Land, where she reportedly lost her sight, Angela returned to Brescia, which had become a haven for refugees from the many wars then wracking Italy. There she gathered around her a group of women who looked toward Angela as an inspirational leader and as a model of apostolic charity. It was these women, many of them daughters of the wealthy, some orphans themselves, who formed the nucleus of Angela's Company of St. Ursula. Angela named her company after St. Ursula because she regarded her as a model of consecrated virginity. Angela and her original company worked out details of the rule of prayer, and promises, and practices by which they were to live. The Ursulines opened orphanages and schools. In 1535, the Institute of St. Ursula was formally recognized by the Pope and Angela was accorded the title of foundress. During the five remaining years of her life, Angela devoted herself to composing a number of Counsels by which her daughters could happily live. She encouraged them to "live in harmony, united together in one heart and one will. Be bound to one another by the bond of charity, treating each other with respect, helping one another, bearing with one another in Christ Jesus; if you really try to live like this, there is no doubt that the Lord our God will be in your midst." In 1580, Charles Borromeo, Bishop of Milan, inspired by the work of the Ursulines in Brescia, encouraged the foundation of Ursuline houses in all the dioceses of Northern Italy. Charles also encouraged the Ursulines to live together in community rather than in their own homes. He also exhorted them to publicly profess vows of poverty, chastity, and obedience. These actions formalized Angela's original "company" into a religious order of women. 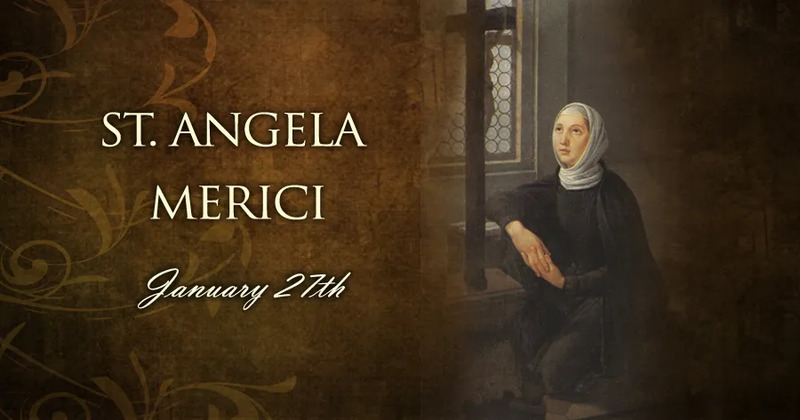 Angela Merici died on January 27, 1540, and was canonized in 1807.